Nine beautiful and healthy puppies (4 girls and 5 boys) born October 19, 2010 . . . Introducing The “Rockstar” Litter! We are honored to have Rocky as the Sire of Csilla’s second litter. The pairing of these two will no doubt produce Vizslas of excellent temperament, correct structure, beauty, health and longevity. “Rocky” is a gorgeous and moderate Vizsla male with beautiful conformation and overall balance. Hefinished his AKC American Championship at 7 1/2 months old with 5 Majors in only 8 shows, he earned four straight Majors in a row in one extended weekend of showing. Shortly thereafter, he followed with his fifth and final Major to complete his Championship title. He then went on to finish his Canadian Championship at 10 months old. Before age 18 months, Rocky was awarded several Best of Breed wins and earned multiple Sporting Group Placements — all owner handled! With relative ease, Rocky finished his AKC Grand Championship, owner handled, in August 2010. Rocky is a phenomenal “show dog” but he also shares the same wonderful and sound temperamentof his parents; Sire: BISS GCH Tivoliz CC Joint Venture JH ROM “Owe’n”, and Dam: CH Szizlin Aint She Captivati’n NA NAJ TDI CGC “Kayla”. Rocky and his parents, Owe’n and Kayla, attended The Westminster Kennel Club’s 134th Annual Dog Show at Madison Square Garden in February 2010. “Rocky’s” 4-generation pedigree reflects some of the most influential Vizslas in the breed; these dogs excelled in Conformation, Hunting, and Agility titles. His pedigree also includes other distinguished Vizslas such as; Traitor, Tailor, Pfalcon, Dillon and Kestrel. Rocky’s Grand-Dam; CH Szizlin’s Ain’t She Inspir’n JH ROM “Siren”, and Sire; “Owe’n” are Top Producers. “Siren” was the #1 Top Producer for 2007 with six Champions (and is a second generation # 1 Top Producer); she is also the “poster girl” for the OFA Champions of Health. “Owe’n” earned his Top Producer in 2009 and 2010 (with five Champions); and has won a Best in Specialty show, multiple Best of Breeds and Specialty Awards of Merit placements, all owner handled. Owe’n finished his AKC Grand Championship title, owner handled, in July 2010. “Csilla’s” 4-generation pedigree reflects a well-rounded and accomplished list of Vizslas who excelled in Conformation, Hunting, and Agility. 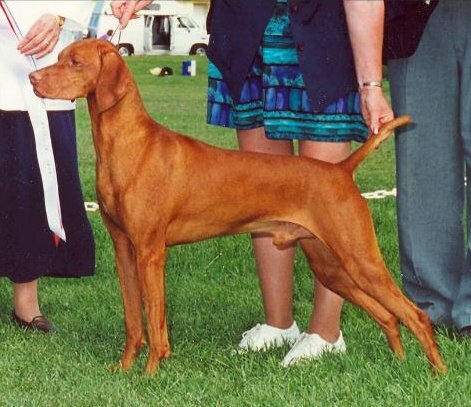 Csilla’s Dam is a three time Best in Specialty Show Winner and Master Hunter, and Csilla is Grand-Daughter of the top winning owner-handled Vizsla in the history of the breed with with 14 Best in Show wins 14 x BIS MBISS 2 x NATL BISS CH Russet Leather Warrior’s Mark JH ROM “Bismark”. Her pedigree also includes other distinguished Vizslas such as; Secret, Charger, Calla, Danny, Gator and Cutter. “Csilla” is a proven producer and highlights of her progeny can be found on the Champions and Up & Coming Progeny page.